1923 – On June 27th John Logie Baird took out a small advertisement in 'The Times' Personal Column, which read: SEEING by WIRELESS. –Inventor of apparatus wishes to hear from someone who will assist (not financially) in making working model. –Write Box S.686; The Times, E.C.4. Bairds ‘invention’ was comprised of an old tea chest, purchased for a few pennies which formed the base that carried a motor, which rotated the exploring disc, while an empty biscuit box housed the projection lamp. Scanning discs were cut out of cardboard, and the mountings consisted of darning needles and old scrap timber. The necessary lenses on the optical side of the apparatus were procured from bicycle shops at a cost of fourpence each, while electric motors ready for the scrap-heap were pressed into service on duties for which they were never intended. At the time there were a great deal of ex-Government wirelesses available for a very minimal cost, and Baird bought scraps of these for his own use, adapting them to his needs. One or two old hat boxes were also utilised, and the whole conglomeration of bits and pieces was precariously held together with glue, sealing wax and odd lengths of string. These early experiments also demanded a high use of electricity and this was supplied by accumulators, (storage batteries similar to those used in motor vehicles), for lighting. 1923 – 26th July - John Logie Baird made his first patent application, No 222,604, for a system of transmitting views, portraits and scenes by telegraphy or wireless telegraphy. 1923 – Vladimir Kosma Zworykin who trained under Rosing at the St Petersburg Institute of Technology filed a patent application (No. 2,141,059) for what would later be mistakenly referred to as the Iconoscope – the first practical television transmission tube. Suposedly the forerunner of the electronic Emitron camera was a device which used photo-electric effects (the ejection of electrons from metals by the action of light) as a basis for scanning and converting images into electric currents. Zworykin, who had emigrated to America in 1919, is revered there as the father of modern television. He had been a radio expert in the Russian Army signal corps during World War 1 (a war which stimulated technical advances of paramount importance to the development of television and in 1924 he filed another patent for, again mistakenly referred to in historical records, as the Kinescope (the picture tube). What Zworykin describes in the application - which was pending 15 years and went through several lawsuits (interference proceedings) before it was granted - is very much like the system Campbell Swinton had described at length in his Nature article of December 7th, 1911. In fact such was the likeness that the Campbell Swinton publication would later be brought up by the U.S. Patent Office during the prosecution of the Zworykin application as a priority document, especially as the Campbell Swinton system was discussed in a book by Martin, published in 1921 in London and New York. New research has uncovered that the name Iconoscope was first decided upon on October 23, 1931, upon the successful production of the first promising samples of experimental transmitting tubes. But this name was never used in public until 1933 and was never meant to be used for anything but the NEW tube. The curators of the Smithsonian Institution have double checked the entire literature and confirmed that this name never occurred in any publication before 1933. Also, the 1924 Zworykin application is surely not the basis for the Kinescope, rather the November 16th, 1929 Zworykin application is the basis for the Kinescope, a name not thought of until sometime in 1930. The most salient feature of the receivers we can call Kinescopes is that they possess the means to concentrate the cathode ray electrostatically. Zworykin introduced this device in a late 1929 article. Unfortunately Chevallier filed his "Kinescope" patent earlier, and Kálmán Tihanyi (see 20th March 1926 entry) 2-3 years earlier! 1925 – 25th March Baird presents the first public demonstration of ‘silhouette television’ at Selfridges store in London’s Oxford Street. Mr Gordon Selfridge Junior got to hear of Baird’s experiments that had resulted in the transmission of simple “shadowgraphs”, and after making some enquiries he called on Baird at Frith Street. He was given a demonstration and saw transmitted from one room to another a crude outline of a paper mask. ªThis was made to wink by covering the eyeholes with white paper, and it could be made to open and close its mouth by covering and uncovering the slot corresponding to the mouth opening. Selfridge was impressed enough to arrange for Baird to give personal demonstrations of the new device for three weeks at his Oxford Street store. 1925 – In Japan a young lecturer called Kenjiro Takayanagi began research on television after reading about the new technology in a French magazine. 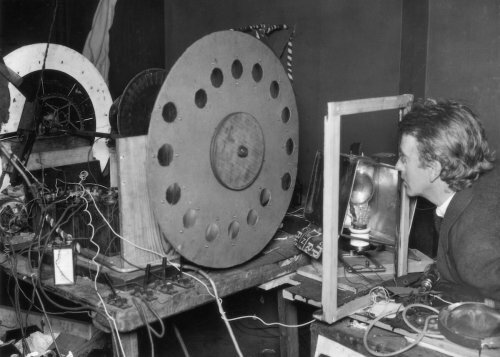 He developed a system similar to that of John Logie Baird, using a Nipkow disk to scan the subject and generate electrical signals. But unlike Baird, Takayanagi took the important step of using a cathode ray tube to display the received signal, thereby developing the first "all-electronic" television set. 1925 – 13th June Charles Francis Jenkins set up receiving apparatus in his laboratory on Conneticut Avenue, Washington, and received a transmission from the navy radio station NOF in Anacostia. Present were Secretary Curtis D. Wilbur, Admiral David W. Taylor, George K. Bungeso – head of the Bureau of Standards, and William D. Tennell – chief radio expert of the Department of Commerce. They watched a ten-minute broadcast of a small Dutch windmill in motion from a film produced by Jenkins on a 10x12in (25x30cm) screen. The image only appeared in silhouette. Flushed with success, Baird rushed downstairs where he came across William Taynton, a young office boy working for a Mr. Cross on the floor below. In a flood of excited broad Scotch, Baird convinced the office boy to go upstairs and sit before the transmitter where enormous electric lamps gave out a glaring light and a great deal of heat. Baird rushed to the next room to see the results on his receiver but was dismayed to discover that it was entirely blank. No amount of adjusting the equipment would produce a picture, and a crest-fallen Baird went back to the transmitter. Under the intense heat, Taynton had moved away from the lamps and had moved out of focus. In what Baird described as “the excitement of the moment” he gave the boy half-a-crown (12½p) and explained that he must remain exactly where placed. This time Taynton’s image appeared on the receiving screen. 1925/26 – A demonstration given by Vladimir Zworykin sometime late 1925 or early 1926 (not in 1923, as popular accounts would have it) was far from a success with his bosses at the Westinghouse laboratories in Pittsburgh where he was employed. Even though it showed the possibilities inherent in a system based on the Braun tube, he was told by management to "devote his time to more practical endeavours". Zworykin continued his efforts to perfect his system as attested to by his own writing, including his doctoral dissertation of 1926, earning him a PhD from the University of Pittsburgh, his experiments were directed at improving the output of photoelectric cells. 1926 – 27th January, John Logie Baird demonstrated true television in public for the first time to members of the Royal Institute at his Soho premises. Nearly fifty scientists duly attended the attics of 22 Frith Street, entering Baird’s accommodation in batches of half a dozen at a time. This was the first public demonstration of true television anywhere in the world. Before 27th January 1926 nothing but the transmission of simple outlines and silhouettes had ever been demonstrated in any country. 1926 – March 20th, - Kálmán Tihanyi a Hungarian physicist, electrical engineer and inventor filed his first patent application for his fully electronic television system. Though it may at first seem similar to some earlier proposals also employing the cathode-ray tube (Braun tube) for both transmitter and receiver, on closer examination the system Tihanyi described represents a radical departure. Like the final, improved version Tihanyi would patent in 1928, it embodied an entirely new concept in design and operation, building upon a phenomenon that would become known as the "storage principle". This involved the maintenance of photoemission from the lightsensitive layer of the photoraster (the "eye" of the camera) between scannings. By this means the accumulation of positive charges would take place and the "latent electric picture" would be stored. This would mean an effective increase in the picture current by a factor that under ideal conditions would equal the number of picture elements (pixels). 1926 – December 25th, Kenjiro Takayanagi successfully demonstrated his system at Hamamatsu Industrial High School in Japan, where he was teaching at the time. The first picture he transmitted made up of 40 scan lines was of the Japanese katakana character called 'I.' This was several months before Philo T. Farnsworth demonstrated his first fully electronic system on September 7, 1927, which did not require a Nipkow disk. 1926 – American inventor Philo Farnsworth formed a research partnership with George Everson in Salt Lake City to develop Farnsworth's television ideas. Farnsworth moved to Los Angeles to carry out research. Within months, he was ready to demonstrate his models and blueprints to a patent attorney who was a national authority on electrophysics. They agreed Farnsworth should apply for patents, which became critical to later disputes with RCA. Farnsworth's innovation was to recognize that a satisfactory image, using whirling disks, would require a speed that was a mechanical impossibility, and that his own all-electronic system could produce an image for broadcast much more effectively. 1927 – The sound made by Baird’s images always fascinated him. He claimed that he could distinguish between a cabbage or a face, a moving or a still image, simply by the sound it made. This led to his recording the signals with a needle cutting into a wax disc responding to signals from the microphone. In October 1926 Baird applied for British patent No. 289,104. In January 1927 he applied for a second patent No. 292,632 to provide for metal discs. He planned to later market these recordings and called his invention Phonovision. A few of the discs that Baird made still survive and are a unique record of early television footage. This was the first ever example of a 'telerecording' but it was many years before the equipment to play back these discs was actually invented. 1927 – The USA’s first public demonstration was on 17th April, 1927 by the American Telephone & Telegraph Company organised by Dr. Herbert Ives and his research team. Images were sent by wire for a distance of 200 miles between Washington and New York. The demonstration was staged amid great publicity and elaboration and occupied the services of about 1000 engineers. It was a two-part experimental transmission. The first originated in Washington DC, beginning with a brief appearance by Herbert Hoover, Secretary of Commerce, followed by John J. Carty, AT&T vice-president, and others. 1927 – On 26th May, the first public demonstration of a television transmission between two major cities in Britain took place when John Logie Baird spoke from his London base to Sir John S. Samuel at the Central Station Hotel in Glasgow. 1927 – Hans Busch discovered that axially symmetric electric and magnetic fields acted in the same manner as glass lenses acted on light beams. 1927 – On September 7th 1927 Philo Farnsworth's Image Dissector camera tube transmitted its first image, a simple straight line, at his laboratory at 202 Green Street in San Francisco. The source of the image was a glass slide, backlit by an arc lamp. This was due to the lack of light sensitivity of the Image Dissector tube design. 1927 – Autumn – Philo Taylor Farnsworth developed the first electronic television system when he succeeded in transmitting a low-definition image of his brother-in-law, Cliff Gardner, at 202 Green Street, Los Angeles, California. At one stage the premises were raided by the police who suspected the equipment for transmitting his images was in fact an illicit still. Farnsworth’s device was similar to the Iconoscope of his contemporary, Vladimir K. Zworkin (from whom he worked independently), a ‘dissector tube’ or orthicon capable of dividing an image into parts whose light values could be restored to form a reproduction of the original picture. It was 1935 before Farsnworth was ready to demonstrate a high definition receiving and transmitting system and in 1929 his patents were assigned to the Radio Corporation of America (RCA). 1928 – 11th May, General Electric began test broadcasts over WGY Schenectady, NY. They announced that ‘only faces of men talking, laughing or smoking will be broadcast; no elaborate effects are planned at this stage.” At around the same time other tests were carried out most notably by WRNY (New York), WLEX (Lexington, Mass.) and WCFL (Chicago). 1928 – Boris Pavlovich Grabovsky, a Soviet engineer, (later) claims that to have made the first electronic broadcast in 1926. "Ivan Philipovich went to Leningrad where, under Professor Rosing's guidance, electronic tubes were made, and he bought them to Tashkent, and we carried out the first experiments in my apartment. Pictures of a bright spot were transmitted and the movement of a hand.” He said. ('Television' by Francis Wheen published in 1985). Other records differ – some claiming that Grabovsky didn’t achieve this until 1928 which may be more accurate because a patent was issued to him on July 30th, 1928 which concluded: "The author of the device to transmit mobile picture at a distance is the citizen of the Union of Soviet Socialist Republics." It is doubtful he would have waited two years to apply for a patent. 1928 – Kálmán Tihanyi filed two separate patent applications for a his fully electronic television then extended patent protection beyond Germany, filing in France, England and the United States, among others. Later in 1928, Tihanyi went to Berlin, where the development of television, that is, mechanical type of television involving Nipkow disks, had already begun by the German Post and the larger manufacturers. The invention was received with enthusiasm by Telefunken and Siemens, but in the end they opted to continue with the development of mechanical television. 1928 – Philo Farnsworth developed his system sufficiently to hold a demonstration for the press. His backers had demanded to know when they would see dollars from the invention. The first image shown to them was a dollar sign. In 1929, the system was further improved by elimination of a motor-generator; the television system now had no mechanical moving parts. 1928 – On July 3, 1928, John Logie Baird demonstrated the world's first colour transmission using scanning discs at the transmitting and receiving ends with three spirals of apertures, each spiral with a filter of a different primary colour; and three light sources at the receiving end, with a commutator to alternate their illumination. That same year he also demonstrated stereoscopic television. 1928 – 11th September - W2XB (owned by General Electric's WGY) in Schenectady, NY televised the first dramatic programme in the United States, "The Queen's Messenger," by J. Harley Manners. It had a cast of two; the lady played by Izotta Jewell, the Messenger by Maurice Randall. Three cameras were used and the players could only be seen in close-up (one camera each). For shots of them holding various objects such as cigarettes, glasses, keys and a despatch case ‘doubles’ were used and they were Joyce E. Rector and William J. Toniski (hence the need for the third camera). The 40-minute transmission was on a low-definition 24-line mechanical system developed by Dr. Ernest Alexanderson and was watched on a screen 4x3in (10x8cm). 1929 - Kálmán Tihanyi begins work on television guidance for defence applications, building prototypes of a camera for remotely guided aircraft in London for the British Air Ministry. Tihanyi also develops a special, infrared-sensitive (night) television camera, which was patented for the control of airplanes and military vehicles. 1929 – 30th September – the first daily television service began when Baird programmes were transmitted on a low definition (30 lines) service from the BBC. 1929 – Vladimir Zworykin returned to vibrating mirrors and facsimile transmission, filing patents describing these. At this time, however, he was also experimenting with an improved cathode ray receiving tube, filing a patent application for this in November 1929, and introducing the new receiver that he named Kinescope, reading a paper two days later at a convention of the Institute of Radio Engineers. Having developed the prototype of the receiver by December, Zworykin met David Sarnoff, who eventually hired him and put him in charge of television development for RCA at their newly established laboratories in Camden, New Jersey. 1929 – In France, 30-line pictures are demonstrated by René Barthélemy. 1930 – Vladimir Zworykin visited Philo Farnsworth's laboratory under false pretences (ostensibly representing Westinghouse as a customer, but actually gathering information for RCA as a competitor). Zworykin was impressed with the performance of the Image Dissector and had his engineers make a working copy of it. 1930 – Vladimir Zworykin began to develop a transmitter. There was an in-house evaluation at RCA in mid-1930, where the kinescope performed well with 80-line definition, but the transmitter was of a mechanical type. The breakthrough would come when the Zworykin team decided to develop a new type of cathode ray transmitter, one described in the French and British patents of 1928 priority by Kálmán Tihanyi whom the company had approached in July 1930, after the publication of his patents in England and France. This was a curious design, one where the scanning electron beam would strike the photoelectric cell from the same side where the optical image was cast. Even more importantly, it was a system characterized by an operation based on an entirely new principle, the principle of the accumulation and storage of charges during the entire time between two scansions by the cathode-ray beam. 1930 - Kálmán Tihanyi is approached by RCA following the publications of his patents in England and France. Negotiations continue until 1934. Researched using available sources in print, the Internet and as a result of emails and consultation. Baird's images gradually achieved more clarity.